Gumusluk Accommodation & Tourist Guide - hotels, b&bs, apartments, guest houses & more! The webs favourite guide to Gumusluk (Gümüşlük)- If your looking for somewhere to stay in Turkey then you have come to the right place, this websites features beautiful properties in the tranquil undiscovered fishing village of Gumusluk. Use the navigation along the top of the page to find accommodation, restaurants, things to do, places to go, Gumusluk tourist information & much more! We currently have one property available to rent, more information can found on the accommodation page or via the quick links down the right hand side of this page. 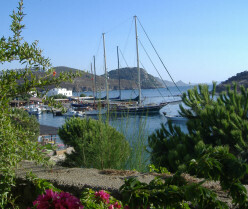 Located in the South West of Turkey, Gumusluk is the ideal holiday destination for everyone. 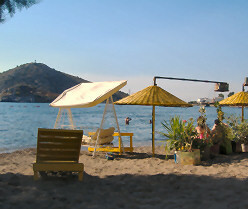 The resort is situated on the grounds of an ancient city, know as Myndos. Because of this Gumusluk is protected against developments, which means unlike many other holiday destinations it has not been over exposed. Bars & Restaurants are also forbidden from playing music too loud, but it is the people who live in the village itself that make the place as they are some of the friendliest people you have ever met, and will go to almost any length to make sure your stay is enjoyable.